On Sunday, Sept. 16, Kenya’s Olympic champion and master marathoner Eliud Kipchoge broke the World Record in the men’s marathon in Berlin. Kipchoge shaved 78 seconds off of Dennis Kimetto’s 2014 record of two hours, two minutes and 57 seconds, crossing the line in two hours, one minute and 40 seconds. Runners and fans of the sport, like myself, were sure the men’s world record would go down last April when Kipchoge took to the streets for the London Marathon, but sweltering heat left the record intact. It was inevitable Kipchoge would break the record eventually and there was really no sweeter place for it to happen than in Berlin. Kipchoge broke the tape in record timing running in the same race in which Berlin Dennis Kimetto took the record down four years ago. Suffice it to say it had been a long time coming. Eliud Kipchoge, 33, is a Kenyan long distance runner turned marathoner. Kipchoge has three Olympic medals, four World Championship medals and eight major World Marathon medals — seven of them gold. Not only is Kipchoge dominant across long distances —particularly in the 5000 meter — but he is also a sub-four minute miler with a personal best of 3:50.40. On May 6, 2017, Eliud Kipchoge unofficially broke the world record in Nike’s Breaking2 project. Three of the world’s fastest men raced against the clock in an attempt to run 26.2 miles in under two hours, and Kipchoge came the closest to doing so, coming in at 2 hours and 25 seconds. Because the race took place on a Formula One race track in Monza, Italy, rather than an official marathon course, the world record remained intact. The record coming down wasn’t what mattered, though, because the world had just watched Eliud Kipchoge run the fastest time in the marathon in history, and since then it has been waiting for him to do it again. So, what’s next now that Eliud Kipchoge is officially the fastest marathoner of all time? While no public statement has been made on behalf of the superstar, fans are speculating and hoping he will take another stab at going under two hours. Kipchoge has ran undefeated since 2014, taking the gold medal in Rio de Janeiro’s 2016 Summer Olympics and now the world record. Kipchoge has run 11 marathons in his career. Aside from the Olympic marathon in 2016 and a few smaller-scale races, eight of them have been major world marathons. He has run the BMW Berlin Marathon four times, the Virgin Money London Marathon three times, and the Bank of America Chicago Marathon once. The Abbott World Marathon Majors, a set of six of the largest and most prestigious marathons in the world, consists of those three races as well as the Boston Marathon, the Tokyo Marathon, and the TCS New York City Marathon. These races attract the top marathoners in the world, and it is common for elites to race in all of them over the span of their careers. Kipchoge is not on the startlist of the TCS New York City Marathon this year, but because it falls on the list of major world marathons there is a good chance he will be in the future. For Fordham students interested in seeing some of the professional action this year, the New York City Marathon will take place on Sunday, Nov. 4. The last few miles of the race come down through Central Park and the finish is right in Central Park South West, just up the street from Fordham Lincoln Center. 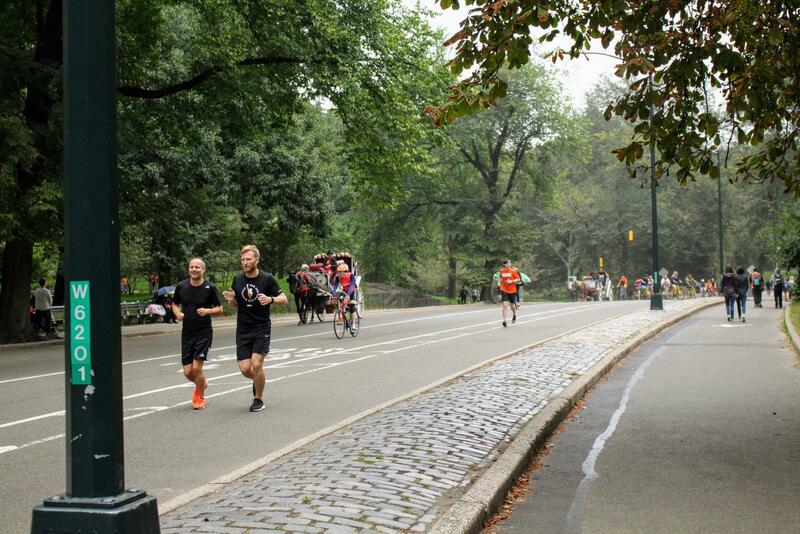 Some of the best spots to watch the race are in the park or in Harlem when there are just a few more miles to go. This year, American and five-time Olympian Bernard Lagat will make his highly anticipated marathon debut in New York City. Other big names include Lelisa Desisa of Ethiopia, Kipchoge’s fellow Breaking2 competitor, as well the defending champion Geoffrey Kamworor of Kenya. Women’s defending champion, American Shalane Flanagan will take to the streets as well on Nov. 4 making for a spectacular race that is not to be missed.